Jigthings is a company that sells a range of products for puzzlers. 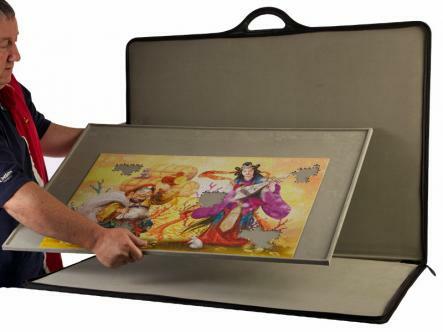 They have puzzle tables, puzzles cases, frames and other storage items to keep puzzles safe and secure. Given the much larger size of the cardboard puzzle market, the products seem primarily designed for that market. However, as a “wood puzzler” I was looking for a way to safely store puzzles that were in progress, rather than just assembling them on a board and moving the board when I needed the space. This “move the board” method was less than ideal. After reading quite a lot of reviews on various websites of different possible solutions I decided to buy a puzzle case and settled on the Jigsort made and sold by Jigthings. Since we assemble puzzles of all sizes from Stave, Par and other manufacturers, I opted for the Jigsort 1500. (I would not recommend buying any smaller size, unless you do very small puzzles, and will explain why later.) The item is very well made and has some great features. 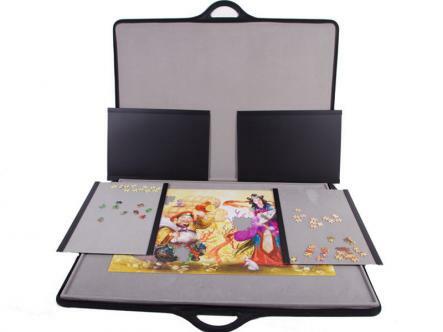 The entire case zips up like an artist’s portfolio, there are several smaller boards to allow you to work on smaller puzzles and/or sections of your main puzzle and the main board has a nice lip around the edge that has been a great help in preventing pieces from falling when assembling the puzzle. The best part, I feel, is the luxurious material that the board is covered in. I am not sure what the material is called, but is similar to what jewelers use for displays. It’s soft and makes it very easy to slide the wood puzzle pieces around the board as you are working the puzzle. As mentioned, our favorite feature is the soft fabric covering. For wood puzzles it makes it incredibly easy to move the “chunks” around that you are working with to see how they fits together. You have the ability to remove the main board (the one with the lip), so you can easily take it to a table and, again, the little lip that surrounds the entire board helps prevent pieces dropping while on the move. The smaller boards (there are 4 with the Jigsort 1500) each are a nice addition, which also makes it easier if multiple people are working on the same puzzle to prevent getting in everyone’s way. The only real issue I have with the Jigsort if that, at least for wood puzzles, I don’t think it would be very practical to try and assemble a 1500 piece puzzle with it. We have assembled a number of wood puzzles in the 600-700 piece range and when you spread them all out on the main board it is pretty filled up. Once it is assembled it obviously fills a lot less space and would probably accommodate a 1500 piece puzzle (with the exception of puzzles such as Pastimes which can have very large pieces), but when you are actually putting it together, it would be very difficult. From the Jigthings website, it looks like the idea behind the case is that you use the smaller 4 boards to help sort and then bring them over the main board as you assemble it. For us, that is not ideal. I prefer to have all the pieces available in one place in front of me, and given how easy it is to lose pieces I prefer not to keep moving them back and forth from one board to another. However, everyone has their own strategy, and I do know many people pre-sort puzzles in trays by color etc., so this is probably a personal preference issue. We will be doing a 1000pc wood puzzle soon, so I will update this post to let you know how crowded it gets (maybe I’ll include a pic) with a puzzle of that size. So really just a warning that practically doing a 1500 piece puzzle will require additional surface area. Thus, I would not recommend buying a smaller size (they come in 500, and 1000pc. sizes as well) unless you were planning on only doing smaller puzzles such as Stave Teasers or Tricks. This is a great puzzle case that I would recommend to anyone. We are actually thinking about purchasing a second one we are so happy with it. It’s high quality construction, has some great features and has given us “piece of mind” (pun intended) knowing that our puzzles are secure from damage and lost pieces while assembling. Note: This is the first review I have written on a puzzle related product. I don’t plan on making this a regular feature, but I am so impressed with the quality of this item that I wanted to share this item with visitors to RAR Puzzles. UPDATE: We have since done several large wooden puzzles, including one close to 1000pcs, since this was written. Again, it gets very crowded if you like to have all of your pieces in one place, but we have been using the 4 extra boards more and that does give us additional room. If your puzzles are non-interlocking then you need to be careful moving them back and forth, but the material does make it easier to use. UPDATE 2: The largest puzzle we have done to date on the board was close to 1400 pieces (wood puzzle). The puzzle itself fit on the board fine, however we did need a lot of extra space for sorting and assembling and used other surfaces. So if you plan on doing a lot of very large puzzles, it may be benefecial to buy 2.